Many of us have a problem with change. This is not good, because the fear of change is paralyzing. In order to move forward and move through challenges it's essential to be willing to face change. The only way to achieve new goals is to move through resistance and fear, there is no other way. Why is it so scary? Everything we know feels kind of comfortable, even if it's not good for us, it's still comfortable. Because of this fear, women stay in bad marriages, in unfulfilling careers and in relationships with friends or family members that are not nurturing. We are scared to leave this comfort zone behind. 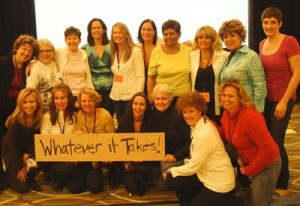 I am thrilled to say that I could move through my resistance and if I could do it, anybody can! ◾Acknowledge yourself for it, big time. 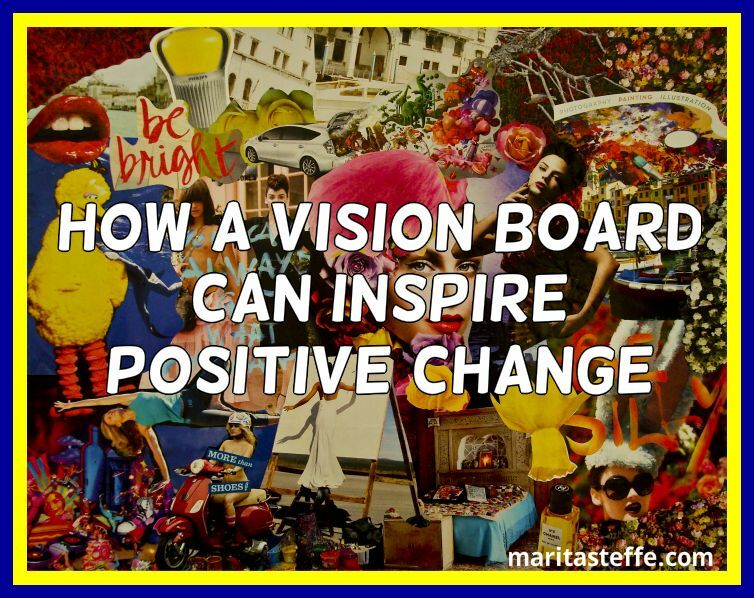 Why is it empowering to make a vision board? A vision board is a great tool, when you feel stuck. It is one simple action step, when the energy is stagnant and you don't know what to do, which direction to move, which way to turn. You cannot do anything wrong, all you can do is to get some ideas to move into a new direction. This might not be the final direction, but it is movement and movement brings inspiration and ideas. Remember that life is always changing and in constant motion. There is nothing to hold on to, if you can get into the flow of change, your life will work out. You are one step closer to creating your life, and to achieve your life dreams. A loving partner, a fulfilling career find images that make you feel like you are in your dream life, you have it, and you are it! Feel the vibration of these feelings. The feeling you have will help you draw the events, people and things into your life, your job is to feel and visualize them. Now have fun and be creative with it. Your board can be simple, or elaborate, it will not make a difference with the effectiveness. If you need more instructions check the YouTube videos below. Let me know how it goes, I always love to read your comments and it helps others too. In order to be self- fulfilled, successful and empowered we need to be confident. It is very interesting how we neglect being confident. It starts by forgetting our successes, even the big ones. How can that happen that we just remember the challenges and failures? It's self-sabotage, it's crazy, but we still do it, because it is unconscious. Can you relate to this? 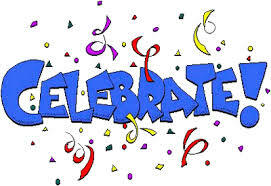 As a life coach I notice this phenomenon all the time and I remind clients and friends whenever I can that they set simple reminders to celebrate successes. Below are 7 simple tips to do this. write some cards with simple affirmations and say them out loud. A universal rule is that everything you do for 21 days will turn into a habit. After 21 days it will be on "automatic pilot". Do you like the idea? Think about it! All the negative habits can be substituted by positive ones and after a while it will be automatic, how great is that! Confidence is developed in childhood. If you had supportive people around, who always celebrated your little or big successes, you probably feel very confident, believe in yourself and trust that you can achieve your life dreams. Congratulations to you! Unfortunately for most of us this is not the case, but the good news is that it can be learned and practiced by doing some very simple things. Meditation for example is very helpful to improve awareness and it will give you the moment you need in order to choose. Do you want to react and how do you want to react to something. Insight meditation is very easy to do, you pretty much just sit and watch your breath for a few minutes. No you do not have to sit for 30 minutes, even 5 to 10 minutes done every day will change your life, I promise! Great video by Jack Canfield, he is one of the pioneers in positive thinking. 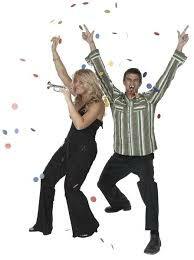 If you feel your life is not working and you are really tired of it, watch this video. Jack always has some great simple tips that can will help you create your life, help you make your dreams come true and achieve your life goals. Learn a new habit and practice it every day, inspire your creative-self. Every day is the key, not once in while, not only when you remember, it has to be on a regular basis, in order for it to work. Most of the things we learned growing up, are not helpful any more, so it's a good idea to replace old patterns, which are not working with new patterns that are working. You want to be happy? This is a way to happiness, it requires work but it's worth it. Create a vision board, keep a running journal of what you desire. Creating a vision board and using a vision board as much as possible is also a great practice to focus on the things you want. The more time we spend focusing on the things we want, the more things will manifest in your life. It's a way for your unconscious to find ways to find ways to manifest your dreams.